What they did mattered then, and what we do matters now. April 15, 2010. This morning, a live broadcast from the Rotunda where we honor the sacrifice of soldiers who, 65 years ago, liberated Jews and other victims from Nazi terror. What they did mattered then, and what we do matters now. Peter Fredlake, USHMM. The United States Congress established the Days of Remembrance as the nation’s annual commemoration of the Holocaust and created the United States Holocaust Memorial Museum as a permanent living memorial to the victims. This year, Holocaust Remembrance Day is Sunday, April 11, 2010. In commemoration of the 65th anniversary of the liberation of Nazi concentration camps, the Museum has designated Stories of Freedom: What You Do Matters as the theme for the 2010 observance. As Allied soldiers were closing in on Germany in the spring of 1945, they encountered dozens of concentration camps and were suddenly confronted with the reality of Nazi atrocities. The few surviving victims fully experienced the depths of human evil and depravity. For the soldiers, however, even the brutality of war did not prepare them for what they encountered. Eisenhower not only understood that this was a war that at its very essence was a struggle for the freedom of peoples and the ideals on which civilization is based but also that the horror was so extreme that it might not be believed. 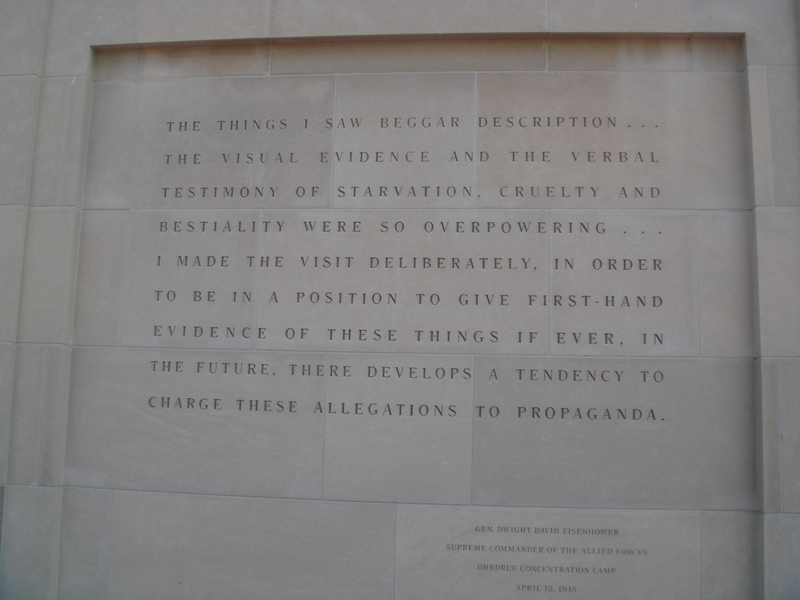 Realizing that a failure to believe would be a danger for the future of mankind, he ordered other soldiers to visit the camps, and encouraged journalists and members of Congress and the British Parliament to bear witness as well. He wanted others to be, just as he was, “in a position to give first-hand evidence of these things if ever, in the future, there develops a tendency to charge these allegations merely to ‘propaganda.’” And ultimately he was right.